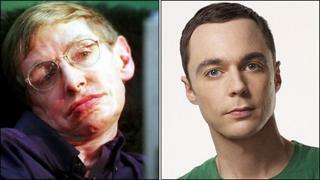 The famous physicist will appear in a scene with socially awkward scientist Sheldon Cooper, played by Jim Parsons. Producers had asked Professor Hawking, best known for his best-selling book A Brief History of Time, to appear on the show before, but he had been too ill to take part. He previously recorded voice-overs for animations The Simpsons and Futurama. Last year, he fronted his own TV series Brave New World for Channel 4, which looked at new developments in science and how they might benefit mankind. It also showcased the Professor's new voice synthesizer, which replaced the robotic voice he has come to be associated with. Professor Hawking relies on text-to-speech software to communicate because of motor neurone disease, which leaves him unable to speak. He turned 70 earlier this year but missed some of his birthday celebrations due to illness. The Big Bang Theory is the second highest-rated comedy on US television, just behind Two And A Half Men. Both were created by Chuck Lorre. The self-styled "geek sitcom" revolves around four insular and awkward scientists and their neighbour Penny, an aspiring actress who works in a Cheesecake Factory restaurant. It has attracted many cameos from sci-fi actors such as Wil Wheaton, Summer Glau and Leonard Nimoy. Several high-profile scientists have also appeared, including astrophysicist Dr George Smoot and theoretical physicist Dr Brian Greene. Professor Hawking has been referenced in the series once before. During the fourth series, comic book fan Howard Wolowitz (Simon Helberg) left Sheldon a fake voicemail, pretending to be the British physicist. "I wish to discuss your theory on black holes," said the message. "Meet me at Randy's Donuts." Professor Hawking's cameo will be screened in the US on 5 April, and on Channel 4 in the UK at a later date.